Since pre-Columbian times, clay has always played a vital role in the life of indigenous Mexican people. 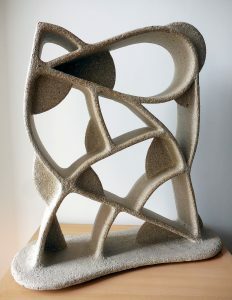 ​”Clay has been in the history of man, and in the history of art,” Torres said. “But also in the prehistory, clay was important. In this contemporary moment, clay is a borderline. It can used to make art, it is just a material, but one that has a very important role in the development of mankind. Man starts using clay not only to represent his spiritual concerns, but also used clay to contain food and water — the things they used to eat with, but also to construct their houses. ​”Tierras Ambulantes,” which translates to “Clay in Transit,” examines the importance of the medium to the seven internationally renowned Mexican artists included in this group show, currently on view at the Mexican Cultural Institute in Northwest. Through the use of this ancient material, the artists demonstrate how bridges are built between the past and the present. ​In an introductory lecture on the exhibit, Torres explained how the Maya blue pigment, and the blue-and-white ceramic tiles brought by the Spanish, define Mexican culture. ​Ana Goméz’ work “Sweet Home” (2013) demonstrates how ceramics fit into home life, using an assortment of household dishes and accessories to illustrate how clay makes a home, but the installation also creates a commentary about women in the domicile. 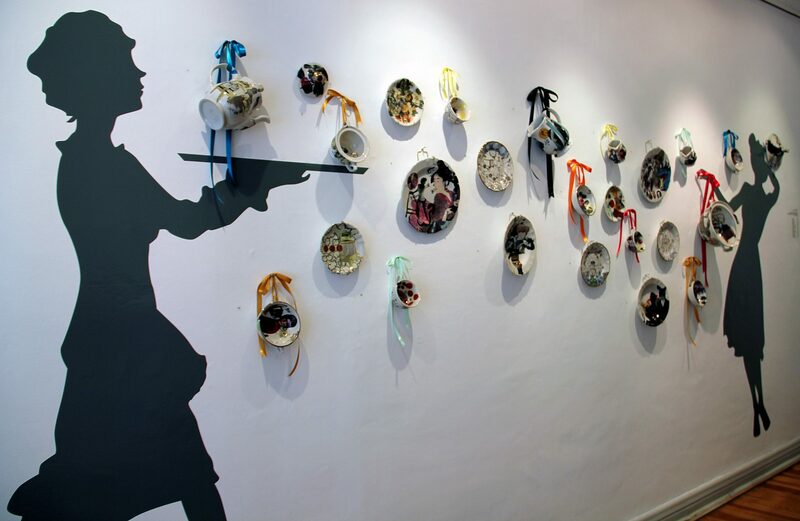 A black silhouette of a woman carrying a tray leads into a room of dishes, teapots and other clay accoutrements mounted on the wall. ​Conversely, artist Saul Kaminer, a Jewish artist whose family immigrated to Mexico, uses clay to create abstractions that may not relate an affinity to ancient Mexican art in form, but make the connection through their titles. His 2008 piece “Cháman (Shaman)” makes reference to indigenous healers in Mexican society, but the forms of his sculpture utilize negative spaces and spare lines, an almost-magical feat to undertake using fragile clay. ​Artist Gustavo Pérez, a revered ceramicist in his native land, uses more traditional forms for his work, recreating the shapes and forms of pre-Columbian utilitarian pieces with the addition of etchings, textures and lines that add an abstract element to the ancient technique of low-fired pots. ​Torres’ pieces are also low-fired clay, but they take on architectural elements, often appearing as spinal cords or supports for buildings like columns. ​”When you mix with another culture that is when beautiful things appear,” Torres said. “Mankind has been migrant all the time moving from one place to another, but that is when major developments have happened. ​”When I was planning the exhibition with the seven artists, I was thinking it should be seven different views working in the same material. Earth is the thread that put us together,” she said. “That is why ‘Clay in Transit’ had to be seven sculptors who have explored working in different materials, but bring their intention to stop time and return to primeval clay. That’s very important. “Tierras Ambulantes” is on view at the Mexican Cultural Institute at 2829 16th St NW through August. The institute is open Monday-Friday, 10 a.m. to 6 p.m. and Saturdays from 12 p.m. to 4 p.m. during the exhibition. Visit www.instituteofmexico.org for more information.